Welcome San Francisco Bay Area Council Alumni Association! If you have ever been involved in Scouting: Cub Scouts, Boy Scouts, Varsity, Venturing, or Exploring, an adult leader or your son has been involved, then you're a member of our alumni family. Please fill out the online membership application. Remember those Boy Scout days of your youth - the hiking, camping, half cooked-half cooked;tin-foil meals and the smell of wood smoke as you sat around the campfire with friends? Each Boy Scout rank brought new challenges, adventures, friends, and fun! 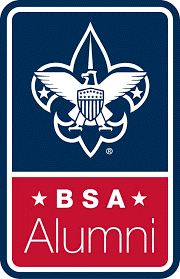 As a BSA Alumnus, you can reconnect with your Scouting past, keep informed on current Boy Scout events, and enjoy opportunities to get re-involved with the same great leadership program you remember. Today's youth need the same kinds of Scouting experiences to develop into tomorrow's leaders. Membership is FREE to all past or present Boy Scouts of America members. Just complete the online membership application to enjoy the following benefits! Keep informed on local Scout events through alumni newsletters and email. Become part of an association helping to connect Scouts and Scouters to one another. Enjoy opportunities for service with local Scout units, districts, or council at Scouting functions. Receive invitations to alumni socials and events. Search out and identify former Scouting members and create an avenue of communication to rekindle the “Spirit of Scouting” in their lives for the benefit of their families and their communities. We invite you to join us and participate in the wonderful world of Scouting!